Life is like the water that flows down a rivers edge. Much like the waters in the river, our lives are forever in a state of change, no two days are the same. Each and everyday brings something new to challenge us. The river water is constantly moving, seemingly in a hurry to get to the ocean. We humans are much like that as well, always in a hurry to get to where we think we need to go. Our emotional state of mind, like the waters of the river, often brings us challenges we must face along the way, and what we love, sometimes we must leave behind. Letting go and allowing our life to drift in new directions is not easy and the inner work to accomplish such a task can be exhausting, punishing and burdensome. But we must allow the river in our Soul to flow naturally without obstruction, in the channel that leads us to our purpose and the true calling of who we are. Life as a human comes with many responsibilities. Our Spirit inhabits our mortal body, which can be a challenge already enough for the most of us. Our physical mortal being needs a lot of care and attention, our duty is to keep it fit and healthy so we live a long and robust life. Our Soul’s care equally is as much work or perhaps even more. What we must accomplish to achieve a healthy and happy Soul brings about uncertain and unstable times, not something a human likes to face with a smile. Disappointments can break our hearts, love can challenge us to the core of our being. Growing in our physical body brings us aches and pains, growing in our Spirit brings emotional upheaval, which is worse you might ask yourself at certain times! 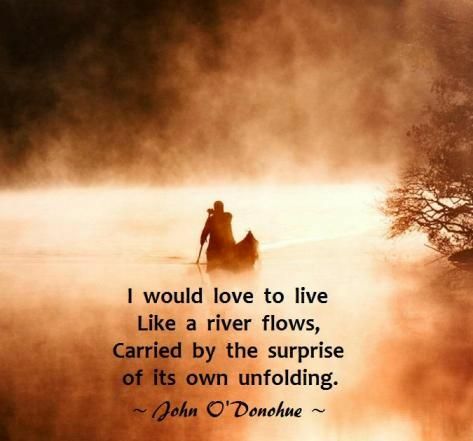 The truth is, life as a human certainly has it ups and downs, and often times we hurt like hell, but if you trust and have faith and allow yourself to move freely with the change that comes your way, just like the flow of the river, it doesn’t have to be difficult at all.